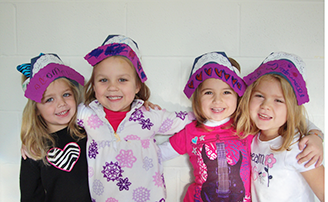 The Wise Owl Preschool in Ft. Thomas offers a warm, inviting atmosphere where their professional, dedicated and compassionate staff creates an optimal setting for learning and fun. The teachers truly care about each and every one of their students and really take the time to get to know them on a personal level. It has been a consistent pleasure to interact with a school where we can send our children with confidence. A few words about Benji's Wise Owl experience...He made it easy for me: Barely two weeks after the school year ended, Benji said: "Mommy, I think I am done with my summer break. Let's just start going to school again." I guess I am in trouble since there are 3 more months of summer break ahead. What more is there to say? ...He loved it from the very first day, looking forward to another day of school each time. He has learned so much, improved his verbal skills, enjoyed socializing with other children, made new friends. I was a bit scared at the beginning knowing he will be one of the youngest in his class but he fell in love with school and the Wise Owl team made it so easy for him to catch up with all other children. Wise Owl preschool was a nurturing, wonderful, safe, and a fun place for all three of our children to begin their education. Our children received encouragement, understanding, lots of love, creativity, physical activity, friendships, affection, as well as exposure to music, spanish and a variety of animals. All three of our kids emerged from Wise Owl with good social skills, confidence, and an excitement about learning! The teachers went above and beyond any of our expectations. We will always have warm, fond memories of this wonderful preschool and it’s teachers. My kids loved their preschool years at Wise Owl, waking up each day asking eagerly, "Do I have school today?" The teachers and staff genuinely care about each and every student. Wise Owl fostered a love of learning that will serve as important educational foundation for the rest of my child's life. Like many Ft. Thomas residents, Wise Owl has become a family tradition for us. My children are second generation students and I feel very blessed that they have been given the opportunity to experience the wonderful early learning environment that I did. Watching their growth from week to week is so special. The kind, knowledgeable, caring, and compassionate teachers and staff at Wise Owl make my children excited to go to school. Our children loved going to Wise Owl, they were excited to go and we loved the environment – it is such a loving and nurturing place. Wise Owl is like family. The staff is amazing and have nurtured and helped both my girls grow. When my oldest went to kindergarten she and 3 other kids were excelling in reading (3 including her Wise Owl graduates). My girls have learned more than the basics. They have developed friendships and learned important social skills. Wise Owl is the best!!! The first time we dropped our son off at Wise Owl was the first time we had left him in the care of a non family member. The routine was familiar as I was once a Wise Owl student myself, but we were nervous to leave. The grin he had when we picked him up let us know we had made the right choice for his first school experience. His teachers helped him develop the foundation for the love of learning. He was cared for, he was exposed to a well rounded curriculum, and he was enjoying himself. Wise Owl gave us all precious memories and we cannot wait for our other children to have the same experience.